Below you find a list with some of the new features that have been added to the latest version of the newsletter / e-mail software SamLogic MultiMailer 2014. We have added a Create Link menu to MultiMailer's user interface. In this menu you will find all functions that handles clickable links in email newsletters. Support for OneDrive. By using Microsoft OneDrive you can share newsletters, mailing lists and other information between different computers that are connected to the Internet. Improved test and preview function. For example, you only need to press Ctrl-T when you want to make a test. Improved upload function for web copies of newsletters. The function is compatible with more firewalls, and the error handling has been improved. You can now insert icons and symbols in newsletters in an easy way. Many ready-to-use icons and symbols are included, for example icons for PDF, Word, Excel, video clips, Facebook, Twitter, LinkedIn, WinZip etc. Automatic check of unsubscribe links. Before MultiMailers starts an email delivery process, it checks that the unsubscribe link is correct. Can now handle mailing lists with 500,000 contacts each. Supports encrypted SSL communication with email servers. Increased support for Microsoft Windows Server 2008 and 2012. Below you find a list of some features that were added to the previous version of SamLogic MultiMailer. Better support for international characters. MultiMailer supports now all characters in the Unicode character system. So you can now create and send newsletters in languages like Chinese, Japanese, Thai, Russia, Arabic, Hebrew etc. The receiver will be able to read the newsletter in the specified language regardless of which language his/her operating system uses. Unicode allows this. Twitter is supported. You can now publish a tweet (Twitter message) directly from the program. So when you send out a newsletter you can also inform about your newsletter on Twitter in an easy way. Support for Dropbox and SkyDrive. This makes it easier to share newsletter, mailing lists and other information between different computers, for example between your home computer and office computer. Support for Office 2013 (Excel 2013 and Outlook 2013). Improved support for creation of newsletters that can be read on smartphones and tablets. Improved functions for finding and handling of doublets of contacts. The image handler application SamLogic Image Resizer has been improved. SamLogic Image Resizer is included in the setup package of MultiMailer and is used for adaption of images for the web and for newsletters. New statistics and analysis functions. You can now see when your contacts open your newsletters. You can see the date and the time. Charts and statistics can now be displayed directly in the Statistics tab. You don't need to open a separate window to view the information. A new filtering function in the Statistics tab. You can in an easy way select mailing items by date and by name. This is very useful if you need to export information from the Statistics tab. Better handling of e-mail bounces. More kind of e-mail bounces are recognized. By maintaing your e-mail bounces in a proper way you will get faster e-mail deliveries and a better open rate. Smarter categorization of contact information during an import. Below you find a list of some features that were added to the 2012 version of SamLogic MultiMailer. A list of all the clickable links, including link text, found in a newsletter can now be displayed in a dialog box. Sometimes it can be difficult to get an overview of all links and link texts in a newsletter, but with this new feature you can see this quickly and easily. Export of contact information from a mailing list can now be made directly to a Microsoft Excel file. Both the. XLS and. XLSX files are supported (Microsoft Excel 2002-2010). The subject line of a mailing is now displayed in the Statistics tab of the program. You can see all the subject lines that you have used in your e-mail campaigns in an orderly manner. Support for Google+ (Google Plus). If you have created a page on Google+; you can now insert a Google+ logotype and a link in your newsletter that opens your Google+ page. If your newsletter reader clicks on the logotype, your page on Google+ is opened in user's web browser. This works in the same way as the Facebook and Twitter logotypes that were introduced in MultiMailer 2011. Read more. The newsletters wizard is updated. Newsletter created by the newsletter wizard in MultiMailer is now compatible with latest version of Google Gmail. We have also developed a series of new header pictures with a height of 100 pixels. You can now add a background that fades between two colors in your newsletter. Read more. The functions of backup and restore of data has improved. Among other things it is easier to recover information now. The image conversion software SamLogic Image Resizer, which optimizes images for web pages, blogs and newsletters, is included. It can also be launched directly from the MultiMailer for quick access. Read more about the program on this information page for SamLogic Image Resizer. The advanced statistics has been enhanced with new features, among other things you can now see how many people that have clicked on links in your newsletter, and you can also see who of your contacts that clicked on links and what links they clicked on. It is easy to make a selection of those contacts that clicked on links in the newsletter and for example send a follow up email to them. Read more. 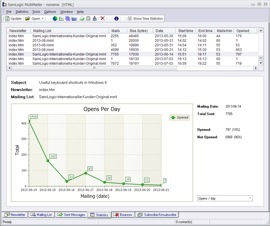 Information about clicked links is shown in the program in different ways, but you can also create a detailed Excel compatible overview report with the same information. 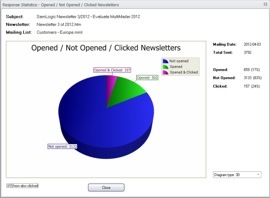 This report also displays other information, such as statistics on opened newsletters. Read more. MultiMailer 2012 can show both the link text and the web address of a clicked link in a newsletter. Sometimes the link text is more interesting to view than the actual web address, if the link text has a descriptive text. With the statistics functions in MultiMailer you can see how many clicks a specific link text has got, and you can compare different link texts with each other. An export of contacts who opened a newsletter or clicked on links in a newsletter can now be done. Information can be saved either as an importable text file or Microsoft Excel file. This is very useful, because information on who clicked on certain links can now be redirected to other persons, such as sellers and informers. Information on e-mail bounces, subscriptions and newsletter cancellations can now be exported directly to Excel. A campaign can now be named in the mailing wizard. Sometimes we do not know what a campaign should be named until it is time to send out, and with this new functionality, you can name the campaign just before mailing. The program interface has been updated and modernized. And new visual themes have been added, so you can work with the graphical interface that you prefer. Below you find a list of some features that were added to the 2011 version of SamLogic MultiMailer. Full support for Microsoft Windows 7 and 64 bit Windows. Data can be imported from Microsoft Excel 2010. Smartphones and mobile phones are now supported. MultiMailer can create newsletters that can be read in smartphones and mobile phones. MultiMailer's user interface has been updated. Now are small symbols used in many of the lists to give extra information about list items (for example contacts). And more visual themes for the editor are available now, for example Office Aqua, Silver, Black and Blue themes. Frame color and background colors for table cells in newsletters can now be easily changed via a menu. Data files, that MultiMailer uses, can now be easily transferred between computers. If you for example change computer or want to synchronize data between two computers, a special program that follows MultiMailer can be used. A user´s guide in PDF format is now included. A navigation tree and hyperlinks in the user's guide's text makes it's easy to navigate between the pages in the book. Web forms for subscribe / unsubscribe / change address requests are now available in 7 languages. The following languages are supported: English, German, Spanish, Swedish, Norwegian, Danish and Finnish. A link generator that creates links to MultiMailer's web forms has been included. You can for example choose language or background color for the web form, and the link generator will create a ready-to-use HTML link that you can insert in your newsletter or in your web page. Compatible with Microsoft Outlook 2010. Contact information can now also be imported from Outlook 2010. Can be run on Windows Server 2008 (also R2). Automatic functions have been added. The program can download e-mail bounces and subscribe / unsubscribe requests automatically when the program starts. You can also press the F12 key to start a download anytime in the program. All lists (that you choose) will be updated in one process. All e-mail bounces and subscribe / unsubscribe requests that are downloaded are now logged in a history database. So whenever you want you can examine a bounces history or check what date a subscription happened. A new insertable field has been included: LastDay. This field returns the highest day number for the current month. So if the month is March it will return 31 and if the month is April it will return 30. This field makes it easier, and more secure, to have time limited offers in newsletters because you never need to change a date (if you use the last day in month as a limit). It is recommended to use this field together with the Month field. A list with news and improvements in older version of SamLogic MultiMailer can be found on this page. If you want to go back to the product page for MultiMailer, click here.